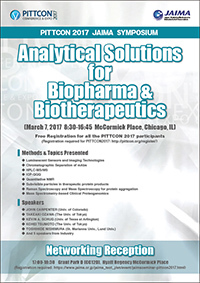 Recent trend and emerging technologies of analytical solution for biopharmaceuticals and biocerapeutics are introduced. This symposium is open for all the PITTCON2017 Participants. Networking reception will be held following the symposium. Copyright © JAIMA All Rights Reserved.